Winter in the southern Mediterranean is a delight – very much the right place at the right time, less crowded and all yours to explore. 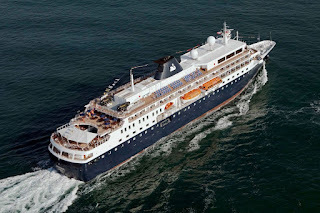 Cruise Traveller (cruisetraveller.com.au) has chosen that time of year for a sparkling new cruise holiday lasting 24 nights and called 'Grand Aegean and Adriatic Explorer'. A fly-free offer gives free round-trip airfares from Australia to join the ship in Athens and return home from Venice. Transfers are included and the itinerary visits brilliant places away from the tourist beat. The ship is MS Minerva, operated by Swan Hellenic. This boutique-size vessel carries no more than 350 passengers. There's a wide choice of included shore excursions. 'Grand Aegean and Adriatic Explorer' is available from A$9655 per person twin share, with FREE flights from Sydney, Brisbane, Melbourne, Adelaide or Perth to Athens and return from Venice. It's valid at that rate until 31 January 2016 unless sold out beforehand. The cruise-holiday gets underway on 14 November 2016 with a flight from Australia to Athens to join MS Minerva. The ship boasts all the refinements of an intimate country house hotel, conveying guests in style and comfort to some the world's most fascinating destinations. There is no shortage of those on this itinerary. The ship stays overnight in Kusadasi (gateway to the ancient city of Ephesus), Athens, Dubrovnik and Venice. You can perch on the peaks of Meteora, known for monasteries set on awe-inspiring heights. Get to know Pella, birthplace of Alexander the Great. A two-night stay in Istanbul gives time to discover its highlights including the Ottoman Blue Mosque. An extended stay in Piraeus includes a visit to Ancient Corinth where St Paul preached and lived for two years. MS Minerva transits the narrow Corinth Canal and sails along Kotor Fjord to the medieval walled town of Kotor in Montenegro, one of the best preserved and most memorable medieval towns in the Adriatic, listed as a UNESCO World Heritage site. Also listed by UNESCO is Dubrovnik, a masterpiece of cream-coloured stone. Sibenik in Dalmatia is another gem, offering some of the most memorable surroundings on the Croatian coast. As well as a full exploration of Venice, Minerva offers a phenomenal variety of complimentary shore excursions. They are available on each day of the cruise and all are all covered by the fare. Choices range from the Royal Tombs of Vergina to Aphrodisia and Nysa in Kusadasi, the Montenegro Riviera and Dubrovnik's Lokrum Island. Enjoy a tour of Split, a city on Croatia's Dalmatian Coast where date palms line a seafront esplanade in front of the Roman Emperor Diocletian's palace – a structure so well preserved that about 3000 people live within its walls today. Explore Istria and marvel at the Doges Palace and St Mark's Square in Venice. An integrated program of talks by guest speakers aboard ship adds in-depth knowledge to the explorations. Another bonus is being able to forget about tipping – all gratuities, both aboard and while touring ashore, are covered in the upfront price. Entrance fees to places of interest visited are covered too, as are all shipboard main meals, including Welcome and Farewell Cocktail Parties followed by Gala Dinners. Freecall 1800 507 777 or (07) 5575 8094.